Yesterday I met with the landscaper and he showed me what areas on my lawn he will need to dig and replace with new soil and grass. The previous owner poured something in a section of the lawn and grass now has trouble growing in that spot. The landscaper thinks he can dig deep enough under the chemical and add in healthy soil. This one area in the back he needs to work on is right by my shed. Luckily, it’s a portable shed and I can have it moved out of the way in no time. Portable sheds are helpful because they can hold small equipment, they can be moved, and they help keep your yard looking nice. My shed is small, but it holds everything I need for my garden. It makes life so convenient when I need to go outside and dig up weeds. I also keep my seeds and fertilizer in there. Walking back and forth from the garage made my gardening time a bit daunting. With my portable shed I have access to everything. My water pail is no more than 10 feet away at all times. The whole point of a portable garden shed is that you can relocate it if you need to. A lot of sheds are really big and they are good for holding larger equipment like riding mowers. Smalltime gardeners like me just need a place for small shovels, flower pots, seeds, and rakes. It would be very difficult for me to get my yard fixed if I had a bigger shed, or a more permanent shed. After I move my shed, I’m going to pay to have the entire area treated that needs to be done, and I can place my shed anywhere else after that. My little shed has a bit of shelving as well. There’s enough wall space to hang things and lean tools against also. Having such an organized space provides a home for my outdoor things. The shed is big enough to hold my collapsible patio furniture as well. Keeping everything in one place helps give my yard an organized look. 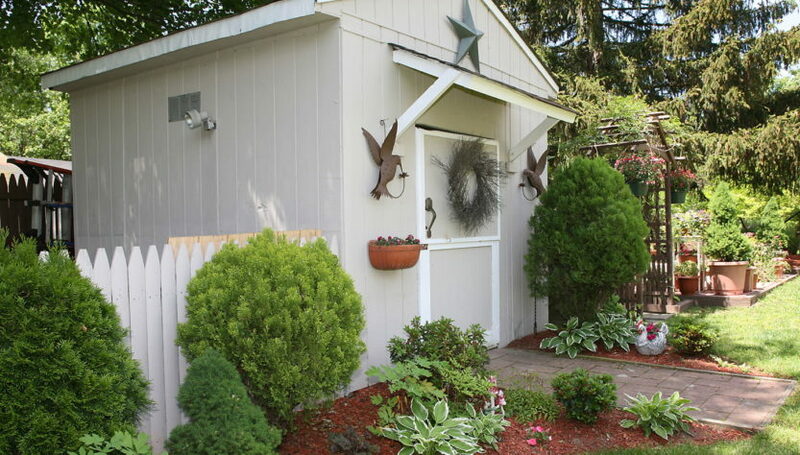 Even when it’s time for my grass to be cut, there is a cute little shed in the back that still gives adds a nice touch to the yard and the home. I got a nice wooden neutral color so it goes great with my yard. Investing in a portable shed is a great way to remove clutter from your garage or piling tools up on the outside of your home. The shed can be locked, so even your most precious outdoor possessions are safe at all times. Portable sheds are great because they can hold small equipment, they can be moved, and they keep your yard looking nice. Stop taking trips to the garage or utility room. A portable shed will allow you to get all of your yard work done while you’re outside. Will A Garden Shed Add Value To Your Property?